Fox News, the favored network of President Trump, has had 30 interviews with him since inauguration day. This week's sit-down may have been the most important one yet, given the increasing legal peril Trump is in. But it was really more of a friendly chat than a hard-hitting interview. "Fox & Friends" co-host Ainsley Earhardt taped the Q&A with Trump at the White House on Wednesday morning. It aired on Thursday. Earhardt asked about Tuesday's bombshells -- when two former members of Trump's inner circle, Michael Cohen and Paul Manafort, became convicted felons -- but in the gentlest possible ways. The questions conveyed none of the gravity of the moment. 1: "Mr. President thank you so much for sitting down with me. How are you doing?" He said he is doing great. 2: "How is our country's first lady doing? And how are your children?" He didn't answer about his children, but he said the first lady is doing great. "She goes through a lot with all this publicity," Trump said. 3: "How do you handle all of that?" Trump says "I've always had controversy in my life and I've always succeeded. I've always won. I've always won." Then he wrongly says the media "never covers" the low unemployment rate. 4. Earhardt turned to Tuesday's "huge news day" and said "there's a lot breaking today as well. Michael Cohen, tell me about your relationship with him." Trump downplays his relationship with Cohen, saying he "didn't do big deals, did small deals," adding, "Not somebody that was with me that much." 5. "He said -- one story said you didn't know anything about the payments and now he's saying that you directed him to make these payments. Did you direct him to make these payments?" Trump says Cohen "made the deal" and pleaded guilty to "two counts that aren't a crime," a reference to two campaign finance violations. Trump says he "watched a number of shows" and heard that "those two counts aren't even a crime." 6. "Did you know about the payments?" Trump says he knew "later on," a claim that is contradicted by Cohen's September 2016 audio tape of a conversation with Trump about the pending payments. Earhardt did not ask about that. Trump reiterated that two of Cohen's guilty counts "weren't crimes." 7: "Why is he doing this? He's your attorney?" Trump says it's because Cohen "made a great deal." He points out that Cohen had "other clients." One of those other clients was Earhardt's colleague Sean Hannity. Earhardt did not mention that. 8: "If it's not illegal -- if you're saying the payments, if they're not illegal, then why would he even -- why would he use that information for a plea deal?" Trump says people sometimes make up stories. "It's called flipping and it almost ought to be illegal." He then goes on a long rant and complains about Democrats being treated differently. Trump, at Earhardt's invitation, continues to complain. He claims that his choice for attorney general, Jeff Sessions, "never took control of the Justice Department." Then he pivots to say the country is "going so well." 10: "Are you considering pardoning Paul Manafort?" In another long answer, Trump says "they got him," meaning Manafort, "on things totally unrelated to the campaign. And by the way, they got Cohen on totally unrelated to the campaign." Actually, two of the counts directly related to Trump's campaign, but Earhardt lets that go. 11: "Mr. President, a lot of people are frustrated. A lot of your supporters are frustrated with the DOJ with Jeff Sessions. There are rumors that you're going to fire him after the mid-terms and Rosenstein. They also want these documents. They're wondering if you will use your power to get these documents released?" "Yes," he says. "At the right time I think I'm going to have to do the documents," he said, in reference to GOP lawmakers' pursuit of documents related to the Russia probe. He claims "there's such corruption" in the administration he oversees. 12: "Rosenstein signed the last FISA report." Trump says it bothers him. 13: "Will you fire him? Will you fire Sessions?" 14: "Let's talk about immigration. Mollie Tibbetts, another American killed by an illegal alien. It's just adding fuel to this already controversial immigration subject that you've been outspoken about. What do you say to those who disagree with your immigration plans?" He defends ICE, attacks Democrats, and says "we're building the wall." 15: "The Nazi prison guard living here in New York, living in Queens. ICE officials deported him. Why was that so important for you? Because I know that was on your agenda, has been since the beginning." Trump says "I have a lot of Jewish friends who said to me about this man living in Queens." He says the Bush and Obama administrations were "unable to pull it off," meaning deport the man, "and I was able to pull it off." 16: "76 days away from the midterms. Hard to believe. If the Democrats take back power, do you believe they will try to impeach you?" Trump says "I don't know how you can impeach somebody who's done a great job" and predicts that the market would crash if he's impeached. Then he pivots to trade deals. 17: "The press. Is the press the enemy of the people?" Trump responds by trying to drive a wedge between "good," approved outlets and "bad" ones. He says the "fake news" is the enemy, and "it's a big chunk, OK? Somebody said what's the chunk. I said 80%. It's a lot. It's a lot." But the other 20% are real. Then he pivots to a long monologue about North Korea and how he isn't treated well by the press. 18: "What grade do you give yourself so far?" He gives himself "an A plus." 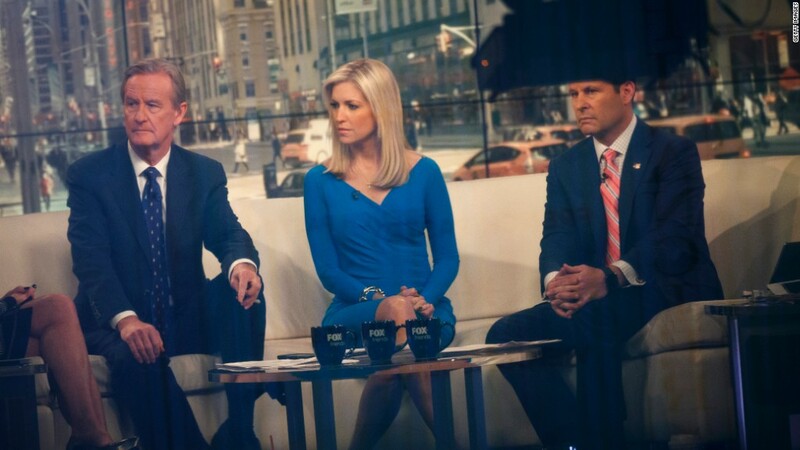 Of course, "Fox & Friends" is more of an entertainment product than a newscast. The show's viewers know that the morning show promotes Trump and his agenda. Most of Trump's interviews are with boosterish shows like this. Fox News, Fox Business and Fox News Radio combined have had 30 interviews with the president, according to CBS reporter and White House stat-keeper Mark Knoller. Reuters, the international news wire, has had 6 interviews. The New York Times, which Trump often derides as "failing," has also had 6.